Welcome precious hearts, this is Anrita Melchizedek and I would like to welcome you to this Equinox transmission as we experience the sacred Comic Fires of Helios and Vesta. As our Sun becomes the Central Sun and Mother Earth, the Spiritual Sun for this Solar System, Helios and Vesta imbue us in the radiance of their Divine Causal Body of Light and the new Earth Templates through the Cosmic ray of Solar Service, a combination of all twelve rays with a focus on the second ray of Love-Wisdom. As we experience the Equinox energies, we are drawn further into the Divine Causal Body of Helios and Vesta, surrounded in an Electronic Ring of Fire, a shield of pure God essence, additionally activated by our Beloved I Am Presence and sustained by the sacred Cosmic Fires of Helios and Vesta. This further assists the Group I Am Avatar Consciousness of Light directive in the focus of the creation of Heaven on Earth, and our ability to maintain and increase our Light Quotient and affect and create change within our realities as we walk the pathway of Divine Love. As the Patterns of Perfection are again being re-experienced through the new Earth Templates in this Golden Age of Light, through the Equinox energies on September 22nd and 23rd, we are offered an opportunity to experience the sacred Cosmic Fires of Helios and Vesta through their great Spiritual Sun Temple of Light, within the etheric Sun behind the physical Sun. These sacred Cosmic Fires are the Light ray qualities of the Ray of Solar Christ Consciousness, and spiral forth in beautiful copper-gold and pink-gold flames. 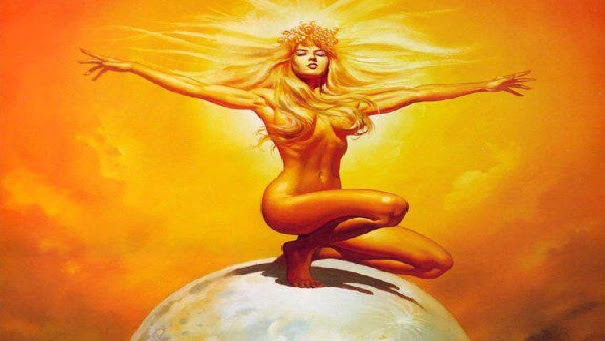 Primarily, the sacred Cosmic Fires of Helios and Vesta will activate the Golden Solar Sun Disc within our hearts as we experience the sacred Cosmic Fires of Perfection, Stability and Equilibrium, Spiritual Truth and Divine Justice, Power, Manifestation, Wisdom, Divine Love and Universal Peace, Purification, Illumination, Abundance and One Unity Consciousness. As each quality activates within the Golden Solar Sun Disc within our hearts, we experience particular invocations, affirmations, Light Chambers, merging timelines, Crystalline Sun DNA Template Activations, a re-union of hearts, and our connection to all the Illumined Beings of Light from On High. As we come together on both the inner and outer planes, we do so as the open hearts in this Golden Age of Light. As these sacred transfiguring Flames of Divine Love and Master Beings of Light. And so it is. So, let us start by setting our sacred space as we come together as One Unified Cosmic Heart.So for a moment now sitting in your sacred space, simply breathe into the body. Breathe initially in through the nose and out the mouth, and as you breathe out through the mouth just allow yourselves to release all that needs to be released in this Now. Breathing in gently, breathing out in such a way that you start to release what is needing to be released in this Now, and finding a balance now in deep rhythmic breaths, feeling into the body, feeling into the physical body, as you start to breathe now through the nose ~ inhaling through the nose, exhaling through the nose, focusing on the lower abdominal muscles, expanding the lower abdomen as you breathe in, contracting the lower abdomen as you breathe out, and finding this rhythmic breath that still allows you the sense of breathing in the Light of Creation, and releasing what needs to be released, through this in-breath and out-breath. Good, now have a sense of merging with your Beloved I Am Presence, the highest aspect of your Soul light within the Cosmic Heart of Mother/Father God. Feel this connection being made now, taking you deeper into your heart, and now activating the Golden Solar Sun disc within your heart. Wonderful. And now call in your Master guides, your guardian Angel and all other Beings of Light from On High you personally acknowledge. And now you connect to the Light workers, the starseeded ones and all the Illumined Beings of Light from On High as you now invoke the Overlighting of Mother/Father God. Calling in now the Pleiadians, the Sirians, the Andromedans and the Arcturians, all of the Light. The Brotherhood of the Light and Lord Melchizedek. The Archangels and their Divine Feminine Counterparts. The Mighty Elohim and their Divine counterparts. Lord Melchior, the Galactic Logos, Helios and Vesta, the Solar Logii, Sanat Kumara, the bridge to Solar Christ Consciousness, Lord Buddha the Planetary Logos, Lord Maitreya and now calling in the Ascended Masters and Ray Masters ~ wonderful. And now just feel yourself connecting into the Unity Grid of Divine Love, connecting to the Light workers, and starseeded ones, and all those joining you from around the globe in the Equinox celebration. And now, you just yourselves comfortably relaxed, grounding into the crystal heart of Mother Earth, as we go on the start of our journey into the sacred Comic Fires of Helios and Vesta. And surrounded now in an Electronic Ring of Fire, a shield of pure God essence. and Solar Heart of Helios and Vesta. we bring a focus to the Golden Solar Sun Disc within our hearts. and the fifth dimensional Earth Templates of Solar Christ Consciousness. takes us deeper into the Cosmic Heart of all Creation. that the pathway forward, through the Christed Timelines, is one of Love and forgiveness. transforming into Light every thought, feeling and action vibrating at a lesser frequency than the Patterns of Perfection and God's Divine Love. guided and directed and sustained by the Beloved I Am Presence of every man, woman and child on this Earth plane. in this sacred Cosmic Fire of Perfection and these beautiful copper-gold and pink-gold rays of Light. and the knowing that all is Divinely Perfect. and the Beloved I Am Presence of every man, woman and child. And now, sweet ones, Helios and Vesta activate the sacred Cosmic Fire of Perfection within the Golden Solar Sun disc within your hearts and within the hearts of all Humanity. Wonderful. As you hold the Patterns of Perfection for yourself and all Life, you now experience the sacred Cosmic Fire of Stability and Equilibrium through the Overlighting of Helios and Vesta, and the many Illumined Beings of Light from On High assisting in this Golden Age of Light. Stability requires you are unchanging in the face of adversity, looking through your Master eyes at all of Life around you. And through the sacred Cosmic Fire of Stability and Equilibrium you experience a blending of earthly and Spiritual experience, manifest as Stability, and the immutability of Mother/Father God. As these sacred transfiguring Flames of Divine Love, you are leading the way through your Divine Love and the recognition that all Life is Divinely equal, with the knowing that only the levels of "Cosmic Consciousness" awareness differs from individual to individual. Stability brings a level of emotional equilibrium, as you release old karmic patternings, false beliefs and judgments, and experience a deeper sense of "controlling your frequency" through the radiance of the Cosmic Heart of all Creation and the Patterns of Perfection, in the knowing that all is Divinely Perfect. You find contentment, peace and stillness of mind and heart in your collective union with the Divine, trusting and surrendering to all that unfolds, while co-creating your heart's dreaming. And now sweet ones, as the Golden Solar Sun disc within your hearts expand, you experience the pulsations of the sacred Cosmic Fire of Stability and Equilibrium through theCausal Body of Helios and Vesta and this beautiful Spiritual Sun Temple of Light. Amplified through the Equinox energies, the sacred Cosmic Fire of Stability and Equilibrium spirals forth from the center of your Sun, and into the Unity Grid of Divine Love, allowing all Life to potentially experience Stability and Equilibrium within their lives and through the infinite, eternal Christed Timelines of Divine Love and One Unity Consciousness. Good. You now experience the sacred Cosmic Fire of Stability and Equilibrium, bringing balance and stability, equilibrium, calm, peace and stillness into your minds and hearts, wrapped in the beautiful copper-gold and pink-gold rays of Helios and Vesta. Wonderful. And now,the Christed ET's step forward to assist you in "fine-tuning" your lower bodies and offering to place you within various Chambers of Light. The Andromedan Intergalactic Beings of the Light now bring in a Molecular Restructuring Chamber of Light. are released and absorbed into the Cosmic Heart of All Creation. allowing all Life to truly know themselves in their full magnificence and Light. The Sirian Archangelic League of the Light now bring in a Purification Rings of Light Chamber. removing toxic energies, implants, elementals and whatever else needs to be purified in this Now. allowing all Life to experience this purification, balance and renewed sense of equilibrium. The Pleiadian Emissaries of the Light now place you into a Light Healing Infusion Chamber of Light. This Light Healing Infusion Chamber infuses each sub-atomic particle in your Beingness with the bio-energetic matrix circuitry of the Crystalline Life-Code Seed Atoms. and recalibrating your lower bodies. allowing all Life to experience this recalibration of their lower bodies, increased vitality and the rejuvenation of their physical bodies. placing you in an Fibonacci Ratio Chamber of Light. and a deep sense of One Unity Consciousness. and allowing all Life the experience of Stability, Equilibrium and One Unity Consciousness in the radiance of their I Am Avatar Bodies of Light. And now, sweet ones, the sacred Cosmic Fire of Stability and Equilibrium activates within the Golden Solar Sun disc within your hearts and within the hearts of all Humanity. Wonderful. Helios and Vesta now anchor the sacred Cosmic Fire of Spiritual Truth and Divine Justice within your hearts and within the Golden Solar Sun Disc within your heart as you become the Spiritual Warriors of Light. as sacred transfiguring Flames of Divine Love. and the knowing that we are guided through the principles of Spiritual Truth, Divine Justice and unconditional Love. as One Voice in Unity Consciousness. we assist in guiding all Life into the Cosmic Heart of Mother/Father God. defending the innocent, the helpless, the homeless and the weak. to reveal the Love of God to every man, women and child. leading the way through the Cosmic embrace of unconditional Love, Divine Justice and Spiritual Truth. these beautiful copper-gold and pink-gold flames of Solar Christ Consciousness. as custodians to Mother Earth and all her Life. And now, sweet ones, the sacred Cosmic Fire of Spiritual Truth and Divine Justice activates within the Golden Solar Sun disc within your hearts and within the hearts of all Humanity. Wonderful. And now, sweet ones, Helios and Vesta anchor the sacred Cosmic Fire of Power within your hearts and within the Golden Solar Sun Disc within your heart. As this occurs, you now sense Archangel Michael coming forward in a beautiful electric Blue Flame of Light, and places within your right hand, should you be right handed, a Diamond Sword of Holy Truth or in your left hand, should you be left handed. This Diamond Sword of Truth comes from the Cosmic Heart of All Creation, from the Cosmic Heart of Mother/Father God and it is wielded in the power of Unity Consciousness, of Divine Justice, of Empowerment and Divine Will. And as you take this Diamond Sword of Truth you experience these qualities as a Spiritual Warrior of Light. As you now align into a deeper level of will, of power, of might, you become the warrior on the chariot, wielding power rather than submitting to it. You now receive this Crystalline Shield of Light in your left hand or your right hand, should you be left-handed. This Crystalline Shield of Light covers your entire body as a huge Crystalline Shield of Light made from the energetic matrix of the New Earth Templates of Divine Love and Unity Consciousness, all the key codes of the collective Consciousness of Light and your own individual key codes, sweet ones, are programmed within your individual Crystalline Shield of Light, and as you reach out and place this on your arm it merges into your energy, becoming one with you. As your subatomic particles spin in this increased Light frequency, the Shield of Light now radiates around your entire body and energy field deflecting, protecting, shielding, activating and increasing your Light, sweet ones. No matter where you stand this shield is a three-hundred and sixty degree protection of intense radiating Divine Love through the core crystalline frequencies of the Cosmic Heart of All Creation, activated through the Unity Grid, activated through your own level of consciousness and Light. Lastly, you are given what is known as the Golden Helmet of Light. This Golden Helmet of Light has four faces, each face symbolizing a particular characteristic of the primary four Archangels ~ Archangel Michael, Uriel, Gabriel and Raphael. One side shows this human face, symbolizing Love and emotion, and is connected to Archangel Raphael; there is a lion's face symbolizing justice and majesty, connected to Archangel Michael; an ox's face symbolizing power and strength connected to Archangel Gabriel, and the last face is that of an eagle symbolizing wisdom and connected to Archangel Uriel. And as you look around in this sacred energetic Blue Flame of Light you see these Archangels now, each one standing around you in the four directions, and you are gifted, sweet ones, with a knowing of how to use this sacred Golden Helmet of Light. As Archangel Michael places this upon your head and further activates the pituitary, the pineal, the hypothalamus glands, you bring in the memories and the connections of having worked with the Archangels in many lifetimes, sweet ones. Wonderful. You are ready for any "battle", any perceived challenge that comes your way, as a Warrior of Light; knowing when to step forward in dynamic right action and when to step back in Love and wisdom, and the Legions of Light surround you always, sweet ones, know this to be your Truth and your reality. Wonderful sweet ones. And now, the sacred Cosmic Fire of Power activates within the Golden Solar Sun disc within your hearts and within the hearts of all Humanity. Wonderful. And now, sweet ones, Helios and Vesta now anchor the sacred Cosmic Fire of Manifestation within your hearts and within the Golden Solar Sun Disc within your heart. As you now bring a focus to the Golden Solar Sun Disc within your heart, you experience these beautiful copper-gold and pink-gold Flames of Manifestation. You have a sense sweet ones, of coming into a new level of discernment; of letting go of power issues, of abandonment, of distrust, of embracing the victim and persecutor consciousness aspects of yourself needing to experience the Flame of Divine Love and the sacred Cosmic Fire of Manifestation. You just let go of any level of disillusionment, betrayal, pain, and loss, lack of self-love, lack of self-compassion. Just feel the heart expanding, and have a sense within your Temple of Divine Love, within your Heart's Temple, that you are surrounded by your soul and star family and friends of the Light, and now your earthly family and friends of the Light and you bring them all into your heart. You are Loved, and you affirm this to yourselves, sweet ones ~ "I AM Loved, I AM Loved, I AM Loved. I AM a sacred transfiguring flame of Divine Love, in service to Mother Earth and all her Life. Love is my guiding Light, and I choose to fully embody and embrace the Divine qualities of Who I AM in this Now as a Master Co-Creator and manifestor to the Company of Heaven." Wonderful sweet ones. You align your will to the Divine Will of Mother/Father God, experiencing yourself now in these beautiful copper-gold and pink-gold Flames of Manifestation ~ and you are ready to take on a deeper level of your service work. This is a new beginning for you, sweet ones, and in the radiance of the Sun and Unity Consciousness, you are imbued with the energetic key codes of Christ Consciousness, coming forth and spiraling into your body from the Inner Earth Sun, from the Golden Solar Sun Disc within your heart, expanding into a greater level of Divine Love within yourself, as you connect now into the Sun, the Central Sun, and the Great Central Sun within the Cosmic Heart of Mother/Father God ~ you take on these key codes, and these fractal geometries, and numerologies that activate a deeper level of remembrance at a cellular level, as this comes through now too in streams of consciousness and Light from the parallel realities of your Highest Potential, taking you into deeper levels of your gifts, as the way showers, leaders, and facilitators in this Golden Age of Light. You have forgiveness in your heart, and compassion, you forgive and Love. You take responsibility for your emotions and allow yourself to fully experience them in order to transmute these emotions that need to be cleared and align you more deeply with your Beloved I AM Presence. As your Beloved I AM Presence merges with you once more you have a knowing of your ability to co-create with the Company of Heaven, and you see clearly now through the Christed Timelines as to what it is that you would like to do in this Now. As the Legions of Light surround you, walking in front of you and next to you and behind you, you magnetize, manifest and bring into your reality all that you are needing in this Now, sweet ones. You are co-creating your Heaven on Earth and this gift of manifestation which brings abundance and Divine Love into your Life, lifts you into a greater level of Solar Christ Consciousness. As the dormant DNA activates now, to the maximum Cosmic Law can allow in this Golden Age of Light, you have a knowing of what you would like to do, of your Heart's Dreaming, of your ability to magnetize and manifest through all Creations of Light. And surrounded now in these beautiful copper-gold and pink-gold flames of Manifestation, you link energetically to the light workers and star seeded ones that can best serve you in your service work. And now sweet ones, you take these beautiful copper-gold and pink-gold flames, this Cosmic Fire of Manifestation, and surround Mother Earth in this beautiful Cosmic Fire of Manifestation, allowing all Life to know they too can manifest in ease and grace. Wonderful sweet ones. And now, Helios and Vesta activate the sacred Cosmic Fire of Manifestation within the Golden Solar Sun disc within your hearts and within the hearts of all Humanity. And now, sweet ones, Helios and Vesta now anchors the sacred Cosmic Fire of Wisdom within your hearts and within the Golden Solar Sun Disc within your heart. You are given the visions through the Christed Timelines as the veils of illusion are lifted and you see clearly through your Master Eyes to these various timelines of your highest potential, of yourselves as Initiates of Light, in ancient Egypt and Atlantis, Lemuria, the Mayan and Aztec cultures, the Native American cultures, perhaps in now moments through the Essene Brotherhood, through the Christed lineage, through the Royal House of Avalon, the Divine Feminine, star seeding the Light of Creation in Divine Love. You recognize yourselves, sweet ones, as the High Priests and Priestesses and you allow this knowledge to be further activated as you have a sense of the inner plane ashrams and schools of learning that you journey to, to come into a deeper level of wisdom. And in this knowing you realize that you are working with the Great White Lodge, the Brotherhood of the Light. And you are lifted in soul consciousness now, into the Great White Lodge stationed in the etheric of Sirius. You are welcomed and greeted as this Initiate of Light into this magnificent multi-coloured City of Light. The Patterns of Perfection within this multi-colored City of Light appear to constantly change, reflecting the many programs of Light and Cosmic Consciousness awareness. These Beings of Light, the Awakened Masters, Sages, Ascended Masters, Masters of wisdom, invite you now to experience a deeper level of your service work. They offer to place you in this Metatron Activated Chamber of Light ~ in reading the energy harmonics of your original Divine eight-cell blueprint relative to the multi-universal blueprint you will feel and experience the electron-positron pairs within your body spinning in increased Light frequencies relative to your level of Cosmic Consciousness awareness. As this Metatron Activated Chamber of Light comes in, Divine energy transmissions powered through the electron pour into your physical energy body, bringing integrated concepts that you may potentially manifest on this physical earth as Initiates of Light, as Melchizedek Initiates of Light. You are given information in these Light Codes, as to how you may best be of service, sweet ones. And now as you prepare to leave this Light Chamber, the Brotherhood of the Light members that have welcomed and greeted you to the Great White Lodge telepathically link you to members of the Order of Melchizedek, of the Great White Lodge on this earth-plane who are involved in similar service work to yourself. You are putting out a call to magnetize and attract into your reality those of a similar service work ~ you are calling upon, sweet ones, your star families of the Light. Additionally you are activated in frequency to be able to receive transmissions of Light from the Great White Lodge, so you may be guided intuitively in making the appropriate decisions in your service work, in your co-creation of Heaven of Earth. Lastly, sweet ones, you are now lifted in soul consciousness to the Cities of Light in Orion, to the central ashram of the Order of Melchizedek. This great ashram brings through many of the wisdom teachings that are now activated for you as you are lifted in soul consciousness into this Temple of Light, to this ashram of the Order of Melchizedek that brings through primarily a deeper level of understanding of all the Initiations of Light. And you glimpse now, through this pyramid of Light that surrounds you, into the Akashic Records ~ your own records, and now into the future of yourself and others ~ of seeing yourself co-creating Heaven on Earth, as these Flames of Divine Love; of deepening your service work, of understanding the laws of creation, of understanding the many contracts that you make on these various levels, with your earthly family, your soul family, your star family, sweet ones. You have reached this level of understanding because you have experienced many lifetimes, to get to this point, to this Now, and it unfolds for you graciously, and harmoniously, and gently, for this is what you are co-creating; a deeper level of Wisdom and insight and understanding, through this sacred Cosmic Fire of Wisdom. Lord Melchizedek comes forward to embrace you now, in his Body of Light. As these memories are fully activated for you, sweet ones, you take a moment once more to experience many of these Initiations of Light that you have undertaken, not only on this earth-plane but in sister dimensions, other dimensions of Light, that connect you too now to your dimensional selves on every dimension of Light. Wonderful sweet ones ~ you now find yourself back in the Spiritual Sun Temple of Helios and Vesta as Helios and Vesta now activate the sacred Cosmic Fire of Wisdom within the Golden Solar Sun disc within your hearts and within the hearts of all Humanity. Wonderful. And now, sweet ones, Helios and Vesta now anchors the sacred Cosmic Fire of Divine Love and Universal Peace within your hearts and within the Golden Solar Sun Disc within your heart as you now experience the Unified Heart Merkaba activation. I now connect to the Light Workers, Starseeded One, and all the Beings of Light from On High assisting in this Golden Age of Light. I now experience the Unified Heart Merkaba activation through the Overlighting of Lord Michael, Lord Metatron and Lord Melchizedek. I clear the karmic timelines no longer necessary to experience in this Golden Age of Light, rescinding and breaking any and all vows and contracts created in this lifetime or any other lifetime/parallel realities, and all incarnations for all time, space and dimensions that no longer serves our Highest Good. I now declare these contracts null and void, understanding these lessons in Love and forgiveness. I bring a focus to the Golden Solar Sun Disc within my heart. I now activate a beautiful Golden Flower of Life sphere 54 feet in diameter around me. And now within this, I create a beautiful silver-gold sphere 10.8 feet in diameter around my Self. all the exact same size, superimposed over one another. 21/13, 33 times God speed to infinity. And now, my Light Body/Merkaba field is activated to the speed of the fifth dimension, to the new Earth Templates of Divine Love. And now, Lord Melchizedek wraps me in the sacred Melchizedek Platinum Flame of Healing. lower density vibrations and frequencies are lifted, transmuted and embraced with the Cosmic Heart of Mother/Father God. and now the sacred Copper-Gold and Pink-Gold Flames of Divine Love and Universal Peace. I assist in clearing each country I am drawn too of karmic energies no longer necessary to be experienced or re-experienced. I now project this star tetrahedronal shape through the hearts and minds of all Humanity and the Overlighting of their Beloved I Am Presence. I now bring a focus to the balancing of the Divine Masculine and Divine Feminine aspects within my Self. and the integration of the new Solar Crystalline keycodes of Light. A volunteer Soul to Mother Earth and all her Life. trusting and surrendering to Mother Father God. in Divine Love, In Peace and One Unity Consciousness. Wonderful sweet ones ~ Helios and Vesta now activate the sacred Cosmic Fire of Divine Love and Universal Peace within the Golden Solar Sun disc within your hearts and within the hearts of all Humanity. And now, sweet ones, Helios and Vesta now anchors the sacred Cosmic Fire of Purification within your hearts and within the Golden Solar Sun Disc within your heart. As this occurs, you now bring a focus to the physical body, sweet ones. You bring a focus to each organ now, each body part, as you take these beautiful copper-gold and pink-gold Flames of Purification into the lungs, into the physical heart, into the liver, the gall bladder, the spleen, the intestines, the stomach ~ to the womb, the testes, the ovaries; and you have a sense too of the cerebral spinal fluid now, creating a deeper sense of movement of the kundalini energies as they activate gently now within this sacred Temple of Light. And as the kundalini moves from chakra to chakra increasing the Spiritual Light within the physical body you see the organs and body parts coming into perfect health and balance. You are eating well, you are looking after the physical body as a Temple of Light. You are looking after the physical form so it rejuvenates and regenerates, and supports you in your Light work, sweet ones. And if there are any areas of specific discomfort or disease, an etheric medical team now comes in. Dr Lorphan and his Medical Assistance Team, the Pleiadian and Sirian Psychic Surgeons, your Higher Self of the Light, your Master Guides, your Guardian Angel and all Beings of Light that you personally acknowledge ~ they are all around you, sweet ones. You are getting healthy and well, and the detoxification process is going gently and smoothly as more Spiritual Light activates within the physical body. You are able to flow graciously and harmoniously in this increased Light frequency. You have a sense of bathing now the physical body in this beautiful golden waterfall of Light, and it comes through the body and energy field clearing the energy field too, coming into the physical body, rejuvenating and healing and cleansing, lifting impurities, negative thought forms and frozen miasms. And as you experience a greater level of the cerebral spinal fluid activating between the spinal column and the brain, the pituitary, the pineal, and hypothalamus glands activate now, and you experience a deeper sense of forgiveness coming through, pouring into your body, through the Cosmic Heart of All Creation, this sacred Fire of Purification. All around you now you see etheric crystals amplifying this purification process for you and are allowing you to let go of your addictions, to let go now through the emotional body of this sense of limitation and old false beliefs that may be holding you back, bringing a greater sense of freedom and spontaneity, creativity and Divine Love into each sub-atomic particle of your Beingness. Removing any obstacles that you may have, perceived challenges, as you simply forgive ~ let go, and let God. You now have a greater sense of holding this Spiritual Light, of purifying the physical body, the emotional body, the mental body, feeling this Love and this nurturing as you lift your mind to the Higher Mind of Mother/Father God. Good. The purification through the sacred Cosmic Fire of Purification amplifies, activates, and embraces All That You Are as these sacred transfiguring flames of Divine Love. You now surround this Earth and all her Life now in these beautiful copper-gold and pink-gold flame of this sacred Cosmic Fire of Purification, through the Overlighting of Helios and Vesta. Wonderful sweet ones ~ Helios and Vesta now activate the sacred Cosmic Fire of Purification within the Golden Solar Sun disc within your hearts and within the hearts of all Humanity. And now, sweet ones, Helios and Vesta now anchor the sacred Cosmic Fire of Illumination within your hearts and within the Golden Solar Sun Disc within your heart as you are wrapped in the beautiful copper-gold and pink-gold flames of Light. Wonderful sweet ones. This beautiful sacred Cosmic Fire of Illumination additionally activates the pituitary and the pineal glands, the hypothalamus gland, and in the new chakra system, the occipital lobe, which is found at the base and back of the head. For this occipital lobe regulates the flow of information from the higher dimensions and your multi-dimensional selves, sweet ones, and you have a sense now of merging with your multi-dimensional selves, a sense of experiencing many multi-dimensional realities simultaneously, of seeing through your Master Eyes at all of Life around you in a greater level of insight and understanding, compassion and Divine Love. In this place of detachment and active participation you observe what you are still working with and needing to integrate, and you move into this flow, sweet ones, that takes you into the Pathways of Divine Love. All pathways before you in this Golden Age are simply Pathways of Divine Love. The Illuminating Light of Creation connects you to the Mind of Mother/Father God. It is an Intelligence that imbues you too with a deep sense of wisdom, and as the third eye activates now, in particular, you experience this sense of clairvoyance, of seeing for both yourselves and others the reality of One Unity Consciousness and how to create this pathway from where you are now, sweet ones, to the pathway of your Highest Potential; and to assist others too through the pathways that you have collectively created through your own perceived challenges on this plane of duality. And this lifts too as you feel simply this energy of Love, this matrix of Divine Love, as you come together as the I AM Avatar Race, as the way showers, light workers, and star seeded ones ~ for you are co-creating Heaven on Earth, and you are doing this, sweet ones, through your collective Light. And what is occurring now as your own light amplifies in a greater knowing of your magnificence and Light as these sacred transfiguring Flames of Divine Love and Master Beings of Light, is your ability to communicate with Nature Intelligence and Nature Spirit Intelligence ~ with the animals, the mammals, and all life forms on this beautiful planet on which you physically exist, sweet ones. And the dolphins and whales have stepped forward now in a greater level of co-creation with the light workers and star seeded ones. These beautiful Beings from Sirius B carry the energy signature of Divine Unconditional Love, which they emit through their energy field and sonic vibrations as they anchor their Light through the crystalline grid within the oceans of Mother Earth, and within and around the 144 Unity Grid of Divine Love, further activating the New Earth Templates. These beautiful Light Beings, the Sirian Archangelic League of the Sea, down stepped their vibration to imbed the key codes of Divine Love and Unity Consciousness prior to the Duality Experiment on this earth plane; and now as you come into a deeper level of your magnificence and Light through the merging timelines, merging the timelines from the karmic timelines into the Christed timelines, through the integration of your Beloved I AM Presence and multi-dimensional selves ~ you re-code these crystalline frequencies, the OMM-Wave Resonance of Divine Unconditional Love in the new body chakra systems, and the corresponding chakras within Mother Earth's Light body. This re-coding through the dolphins and whales is now initially experienced, sweet ones, through the occipital lobe which is found at the base and back of the head, and from here moves through all the chakras. Wonderful sweet ones. It is a time too that you draw upon your Hearts' Dreaming, as you travel the Christed timelines, as you merge with your future selves and for a moment now, you just experience the merging with your future Self of the Light along the Christed Timelines. Good. Wonderful sweet ones ~ Helios and Vesta now activate the sacred Cosmic Fire of Illumination within the Golden Solar Sun disc within your hearts and within the hearts of all Humanity. Video - "Activation Of The Sacred Cosmic Fires of Helios & Vesta"